This podcast I heard about from the Reply All podcast, one of my favorites. Reply All delves into techie things, and they have a great segment called Yes Yes No. They take a Twitter message and break down all the information about it into digestible moments, explaining all the inside jokes of the interwebs. 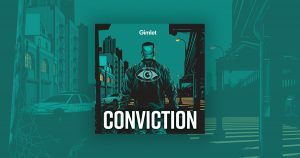 Conviction, this other podcast, follows a bounty hunter-type-man who is trying to solve the trouble of this young man who was wrongly imprisoned for his crimes. There’s drama, some serious matter, but the storytelling is just stellar. I highly recommend this podcast. This entry was posted in Media, What We're Reading by Kelsey Hedrick. Bookmark the permalink.